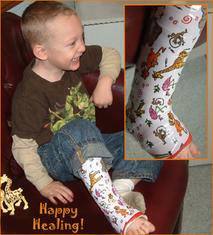 Shrinkins was developed to help children and adults of all ages get through the healing process with a smile! Simply wrap the skin around the item to be decorated, tape the seam and shrink it with your hairdryer. It's that easy! Shrinkins are temporary, reuseable and will leave no sticky residue after removal. 2 -11x17 Shrinkable Skins,4 Tape Strips anddirections on how to get started decorating! So, don't spend your healing time frustrated and disappointed. Spend it showing off your new creation! Within minutes you can be the envy of all your friends! 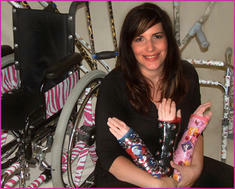 That's really cool, now casts and wheel chairs and stuff won't be typical/boring!!! i could use this... i broke my ankle last week and now i have a boring old cast on my foot and boring old crutches and it's TORCHUREEE!